As I scramble up slickrock, where hundreds of thousands of years ago running water formed an impossibly narrow groove, the nerves kick in. Palms begin to sweat, and my breath quickens as I go over a checklist, questioning what business I have climbing slot canyons in Utah’s greater Zion National Park. After all, we’re not far from 127 Hours territory, right? Will my trail runners keep me from slipping? Are my quads, which haven’t seen so much as a yoga mat in nine months, strong enough to hold me steady? Or am I still the same gangly kid who once tripped on her palazzo pants in fifth grade and broke an arm in the driveway? It’s a kind of gently simmering anxiety I haven’t felt in years, or at least not since I was right out of college and learned how to turn off my fight-or-flight brain while bouldering in Colorado’s Estes Park or jumping off a mountain in Aspen with nothing but a paraglide on my back. Back then, I embraced the spirit of trying anything once, but now in my mid-30s, there’s less to prove. “Fear is a healthy thing,” says my canyoneering guide, Griffin Rasmussen, after he clips me into two series of rope. One is meant for me to hang onto and slowly let out until I meet the ground 70 feet below. The other is in case I have a meltdown and my baby-faced, long-haired keeper has to belay me to safety. “The biggest challenge is overcoming everything your body is telling you, that you’ll die if you go over the edge. Take all that energy and focus it. You’ve got this.” Thanks for the confidence, guy, but if the shrinking space between my shoulders and ears are any indication, I’m not sure I do. OF ALL THE NATIONAL PARKS, Zion has always intimidated me most. Its 229-square miles cover a Flintstones-esque metropolis of mesas and rock formations. Many of the hikes come with steep drop-offs and precarious switchbacks. Meanwhile, the river that cuts into the park and its surrounding public lands often swells during monsoon season’s flash floods. Add to that high elevation (as much as 8,726 feet) and temperatures that can stay well into the 90s during fall in some parts, and there’s plenty to make you think Zion is only for cargo-clad backcountry adventurers. But it’s also one of the most spectacular parks, thanks to big green splashes of cottonwood trees, golden grasslands, camel-colored sand dunes, and cliffs that seem to change from blue to yellow to bright orange as the sun crosses the sky. Natural beauty was guaranteed but, in my mind anyway, survival was not. 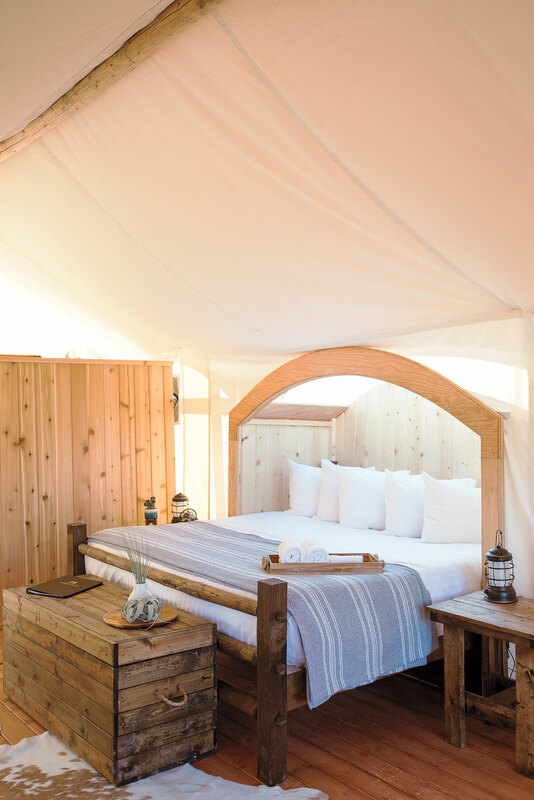 The nice thing that comes with age, though, is there’s no shame in admitting that you might need a little hand-holding—and a big, cushy bed to collapse into after a day of exploring. And that’s how I wound up leaving my backpacking tent at home and doing something my 22-year-old self might have balked at: glamping. Once evening fell and the temperature dropped, I made my way out to the common area. A large group of Italians gathered around tables by the camp’s restaurant to smoke cigarettes; two teenage boys huddled around cell phones while their parents sipped white wine; and another couple, Lucy and Robert Banuelos from Murrieta, California, were celebrating their 25th wedding anniversary over a plate of what were Lucy’s first s’mores. Instead, the idea is to leave the gear at home, relax, and use the stay as a base camp from which to explore “the crown jewels of this nation,” says Sarah. All that raw majesty makes it easy to get caught up in the dreaminess of this place— the sunsets! The winding roads dotted with prickly pear cactus! The shooting stars! But the truth is that for all its beauty, Zion is also a land of some very dramatic reality checks. “OH SWEETIE, YOU DON’T LOOK GOOD,” said Hannah at the front desk, when I stumbled into the lobby tent on my second day, on the cusp of heatstroke. It wasn’t even noon, but my consistent chugs of water were no match for the intense sun. And that’s where my memory fades to black. The next thing I remember, I was reclining in the lobby with cold towels draped over my head and feet, a banana smoothie at my right side, two electrolyte drinks at my left, and three rows of misters showering me from above. Pathetic, I thought. How could I—Ms. Grand Canyon Backpacker 2010, Ms. Sleep In the Back of Her Station Wagon on Road Trips 2014—have let this happen? It ended up taking several hours to bounce back, during which time every person on staff asked how I was doing, shared their own stories of heatstroke (apparently it’s common, even for locals), or insisted I have another smoothie. Clearly, I’d lost my street cred. Had we met earlier this year, his words would have been all the more true. At the beginning of 2017, the Bureau of Land Management, which oversees the public lands on the outskirts of the park, was considering leasing out more than 4,000 acres to gas and oil companies looking to tap into the area’s natural resources. If accepted, Zion’s vistas would have been obstructed by drilling stations and tankers. The Salt Lake Tribune reported on an outcry from the community opposing the decision, including a last-minute plea from the state’s governor, asking the BLM to “protect these parcels, protect these public lands and not open them for leasing.” In June, the proposal was shut down, and the lands remain intact. At least for now. The leasing of the public lands would have also affected the park’s gateway towns like Virgin. (This is Mormon country, and at times it seems every landmark and city has a spiritual meaning.) Here, businesses such as horseback-riding outfitter Zion Canyon Trail Rides at Jacob’s Ranch are built on being able to take visitors like me through public lands and the western border of the park for views of Zion you wouldn’t normally see if you were right in the thick of it. In my case, the view came courtesy of a paint horse named Blue Eyes. Slowly but not so gracefully, I placed my left boot into a stirrup, swung my right leg over the western saddle, and began making my way through a reed-filled creek that leads up to a meadow. Blue Eyes must have been inspired by the sight of the open field, because very quickly we went from a trot to a canter. I took the fact that I remembered how to shift up and down in rhythm with the horse’s gait as a sign that I’d still got “it”—or at least some of it. BUT THE REAL TEST COMES at the tippy top of the Lambs Knoll slot canyon that Rasmussen has led me up to. We’ve already hiked a mile up and over the water course and traversed out to a rappel start, where we squeezed through what climbers call a rock doorway. “At this point, we’re committed,” he says. “Once we pull this rope down, we have to keep on continuing down a crevasse. It’s the only way out.” Remembering Rasmussen’s stories of how people tend to freak out once clipped into the rope system and start walking backward toward the ledge to begin their descent, I’m sure what’s coming next for me. Never mind the panicked lady over here, boys and girls! But suddenly, my anxious mind goes silent. In the shade of the canyon, the breeze feels cool and my harness downright reliable. I find myself simply observing the mineral-like aroma in the air. Dare I say I’m even relaxed? I take a half-squat stance and let out a little slack in the rope to make my first steps down, Batman-style, without looking back. “Nice work. Check out the view!” cheers on my guide. I can’t just yet—still wary of tempting this surprising bit of risk-taking. After a few jogs down the wall, though, I stop and gaze down on a humbling display of nature. It’s a pit, really, one that formed over millions of years as an ocean slowly turned sand into hardened rock, where untold creatures and sea plants might have thrived. Today, it supports brush or cactus that make a home here between the cracks. Above, Rasmussen is ready to snap some photos if only I were to look up at him. No, thanks— I know what I look like. Instead, I decide the real money shot is the one seen through my own eyes. So I take a mental picture, exhale, and push off the wall to lower another few feet—this time with a little more confidence and a lot more bounce. HYDRATION. A 3-liter water bladder that can slip into a day pack goes a long way. Throw in a couple of electrolyte tablets to keep your systems in balance when the heat gets intense. ETIQUETTE. A certified guide can take you into parts of the area that you wouldn’t normally find on your own. 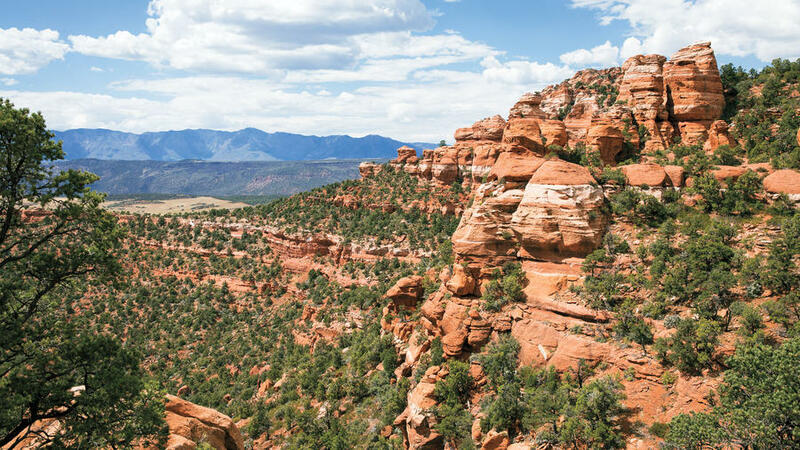 Whether you’re canyoneering, horseback riding, or sightseeing, thank your guide with a tip ($50 for a half-day excursion, or $100 for a full day is about right). SHADE. At elevation, with the sun blazing, sunglasses with UV protection are all the more important. So, too, is a wide-brimmed hat with a chin strap to keep rays off your neck. CALM. This high above sea level, it’s not uncommon for your breath to become shallow and your energy to plummet, even on a short, groomed hike. It may sound counterintuitive, says one of SAW Zion’s guides, Griffin Rasmussen, but think about breathing in through your nose and exhaling through your mouth to help soothe nerves and give your breath a healthy rhythm. STYLE. It can be tempting to upgrade your low-cut trail runners for a stiff, waterproof pair that covers ankles, but stick with the basics. They’ll be lighter and more breathable, keeping your feet cool while you navigate Zion’s terrain.